In the field of mechanical and thermal separation, the HEINKEL group often uses mechanical seals besides shaft seals and stuffing boxes. For the manufacturing of API (Active pharmaceutical ingredients) and fine chemicals, usually non contacting, gas lubricated (lift-off) mechanical seals are used. In the field of horizontal dryers, this solution which prevents cross contamination is increasingly applied by COMBER customers who prefer inert gases as a lubricant. Manufacturing of API and fine chemicals is a highly sensitive field. Amongst others avoiding cross- contamination plays a major role. The sealing of moving parts in pressure vessels ask for special attention. Especially if horizontal mixing shafts are used, product pressing might influence the sealing area during the drying process. In the field of horizontal dryers / reactors COMBER is offering two types: the two-sided shaft sealed Termomix® paddle dryer/reactor and the single shaft sealed Pharmadry® paddle dryer. 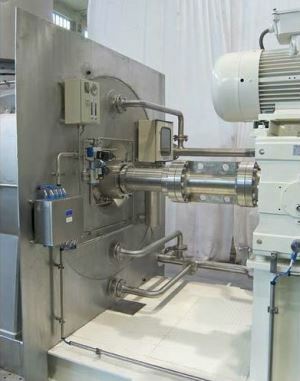 To avoid product ingress into the seal, for example the Pharmadry® vacuum paddle dryer is often equipped with a non contacting gas barrier (lift-off) mechanical seal in aseptic design. The inner seal rings are exposed to the vessel interior. They dispose of rotary seal rings in silicon carbide (SiC) as well as stationary seal rings in DLC coated SiC. The seal is equipped with separate barrier gas and flushing gas supplies, the latter also permitting the seal to be rinsed with solvents. The seal is well accessible at the rear of the dryer. The dryer shown in the picture has a stainless steel wall attached to the vessel rear to separate process and mechanical areas. The spacer between gear box and agitator shaft is removable. This facilitates the removal and reinstallation of the mechanical seal without having to remove the agitator drive. The very feature of applying non contacting gas barrier (lift-off) mechanical seal in different pressure state during the drying process is the setup of Nitrogen flow. In any case it has to be ensured that no product migrates between sealing faces. COMBER did successfully install a range of this sealing worldwide and is the first choice if requested.